Today, the Five-Star Generals Commemorative Silver Dollar Coin remembers when Congress re-instated the title and the president nominated Major General John Schofield for the position on February 6, 1895. John McAllister Schofield (1831 – 1906) held major commands during the Civil War. He also served as U.S. Secretary of War under Presidents Andrew Johnson and Ulysses S. Grant, and Commanding General of the United States Army. Gen. Schofield Named for Lieutenant General. The Bill Re-establishing the Grade Approved. “Provided, however, that when the said grade of lieutenant general shall have once been filled and become vacant, this joint resolution shall thereafter expire and be of no effect. Acting in accordance with this resolution, the President today nominated Major General John M. Schofield to be lieutenant general of the army. Nominations to fill vacancies occasioned by this promotion will be deferred until the Senate shall have acted upon this nomination. The last lieutenant general of the army was Gen. Philip Sheridan, who was promoted to that grade on March 4, 1869. When Gen. Sherman was retired from the active list, in February, 1884, Lieutenant General Sheridan became full commander of the army. Within two hours from the time that this bill reached President Cleveland, Gen. Sheridan was nominated for the highest grade, was confirmed by the Senate and a commission issued to him. The grade of lieutenant general was originated by an act of Congress of May 2, 1798, and on July 3, following, Gen. Washington was appointed to that office, which he held until March 3, 1799, when an act creating the grade of “general of the armies of the United States” and abolishing the grade of lieutenant general was approved. The grade of “lieutenant general by brevet” was, however, established by a resolution of February 15, 1855, “to acknowledge the eminent services of a major general of the army in the late war with Mexico,” with the provision that, having been once filled and become vacant, the resolution establishing it should expire and be of no effect. Two days later Maj. Gen. Winfield Scott was appointed “brevet lieutenant general,” to rank from March 29, 1847. The grade of lieutenant general was not revived again until February 29, 1864, and two days later Gen. Grant was appointed to the position, and he continued to serve in that position until July 25, 1866, when an act was passed reviving the grade of general for his benefit. He served in that grade until he was inaugurated as President on March 4, 1869, when he nominated Generals Sherman and Sheridan for appointment as general and lieutenant general respectively. On July 15, 1870, an act was passed to the effect that the offices of general and lieutenant general should continue only until a vacancy should occur in the same, when the act providing for those grades should be considered as having been repealed. General Schofield himself was unable today to receive the congratulations of his friends, being confined to his home by a severe cold. Lieutenant General John Schofield left the military in September 1895 at the mandatory retirement age of 64. 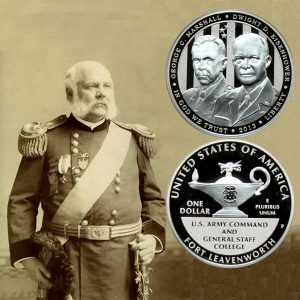 The Five-Star Generals Commemorative Silver Dollar Coin shows with an image of Major General John Schofield, circa 1894.